(2016). Adsorption destructive study of Chlorpyrifos (CP) on the Nickel Tungstate (NiWO4) nanoparticles catalyst by 31PNMR. International Journal of Bio-Inorganic Hybrid Nanomaterials, 5(1), 61-71.
. "Adsorption destructive study of Chlorpyrifos (CP) on the Nickel Tungstate (NiWO4) nanoparticles catalyst by 31PNMR". 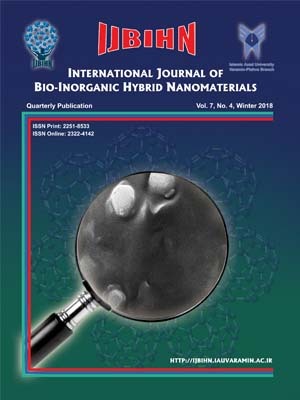 International Journal of Bio-Inorganic Hybrid Nanomaterials, 5, 1, 2016, 61-71. (2016). 'Adsorption destructive study of Chlorpyrifos (CP) on the Nickel Tungstate (NiWO4) nanoparticles catalyst by 31PNMR', International Journal of Bio-Inorganic Hybrid Nanomaterials, 5(1), pp. 61-71. Adsorption destructive study of Chlorpyrifos (CP) on the Nickel Tungstate (NiWO4) nanoparticles catalyst by 31PNMR. International Journal of Bio-Inorganic Hybrid Nanomaterials, 2016; 5(1): 61-71. In this research, the adsorption destructive process of chlorpyrifos (CP,O,O-Diethyl-O-3,5,6-trichloro-2-pyridinyl phosphorothioate) as a noticeable organophosphate pesticide using in agriculture on the nickel tungstate (NiWO4) nanoparticles catalyst was investigated and monitored via the 31P nuclear magnetic resonance (31PNMR). The effects of various experimental parameters such as catalyst dosage, contact time, initial chlorpyrifos concentration and temperature on the elimination efficiency of chlorpyrifos were surveyed. Nickel tungstate (NiWO4) nanoparticles were synthesized by hydrothermal method using NiCl2 and Na2WO4 as the precursors and source of Ni and W, respectively. The structural, morphological, crystal size and elemental composition of the pre-prepared nanoparticles powder were identified using Scanning electron microscopy-energy dispersive micro-analysis (SEM-EDAX), X-ray diffraction (XRD) and Fourier transform infrared (FTIR) techniques. 31PNMR results indicated that chlorpyrifos was successfully eliminated by the catalyst with a yield 100% under optimized conditions. The parameters including: contact time (300 min), catalyst dose (0.3 g/L), initial pesticide concentration (5 mg/L) and temperature (298°K) were considered as optimized conditions for this process. Besides, the reaction kinetic information was studied by applying first order model. The values of the rate constant (k) and half-life (t1/2) were determined as 0.0037 1/min and 187.2972 min, respectively. The main product resulted from destruction reaction between chlorpyrifos and NiWO4 is diethyl phosphorothioic acid (DEPA) which is less toxic than primary pesticide.